Cyprus Weddings – Coral Beach Hotel Cyprus … don’t mind if we do! In May, Clare and I packed all of our gear up and headed of for a Cyprus Wedding. 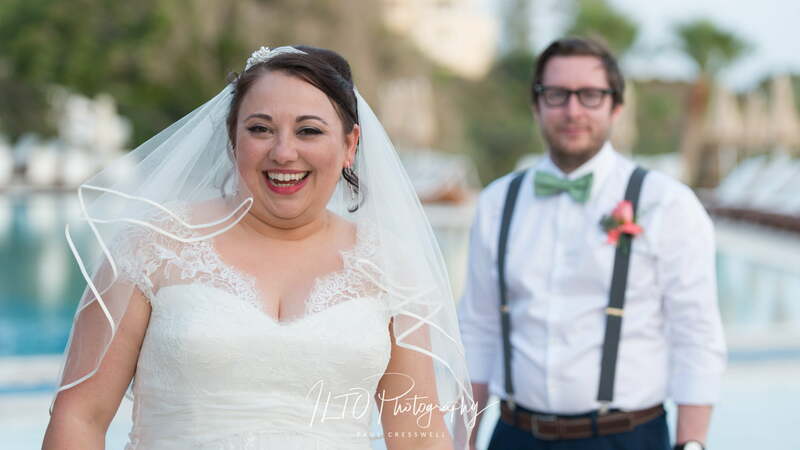 Coral Beach Hotel, just outside Paphos to be specific – so I’m officially a Cyprus Wedding Photographer! Emma & Matt are good friends of ours. There was always going to be a bit more pressure on us the normal! Thankfully there were a few days for us both to acclimatise, and soak up some sun. However, gradually the 70 or so wedding guests starting arriving at the hotel. Come the morning of the wedding, it was warm and cloudy – perfect! Then we had blue skies, a downpour, and then it became hot and overcast! So Cyprus Weddings aren’t to dissimilar to Yorkshire weddings I suppose! Well, in terms of the weather anyway. Apart from it being over 30 degrees of course! Having forgotten what it’s like working in these kinds of temperatures, we were soon roasting and in full swing. The ceremony was a lot quicker than normal, which was great to be honest. The formals were swiftly in the bag, and we were on to the speeches! Having the gleaming bright blue Med as a backdrop was a Cyprus joy. I don’t know why but the light really is different when you’re abroad! From our perspective we really were spoilt! The speeches were only going to be around 25 minutes in total, but 90 minutes later, they were still going strong. The only downside was that it meant we missed the sunset shots! When they were eventually over, Clare, Emma, Matt and I went for a bit of a stroll. We got some great shots by the harbour, the jetty, the pool and in the hotel grounds. A few shots and a couple of beers later, and we were at the first dance. There’s truly something special about this being done outside in the warm air, with the sound so the waves behind you! Not long after this, we decided to put the cameras away. We obviously had to play catch up, and as the bar was free, it was no problem! It’s a fact, Cyprus Weddings ROCK!